Overall I love my new (used) Samsung Galaxy S3, but if I were to be critical of one point it would be the battery life. My initial impression was that this device would need a daily charge to ensure that it would provide sufficient service for a business day (and I’m a very light user). Then I encountered my day of reckoning when I knew I had to do something. I was traveling in an area not entirely familiar to me and I had ensured that my phone had a near full charge (over 90%) before leaving the house. At about 10:30am I was at a neighborhood lawn sale and checking for directions when I spotted that my new (used) S3 was at about 18%... what the heck? Fortunately I had a micro USB charger in the car that I was able to use to put my phone on life support, but that was my wakeup call that I needed to take drastic action. I’ll note that it took me 2-3 attempts to get the hang of it, but it certainly did no harm. 2. Turn On Power Saving mode – This is likely a no-brainer… go to Settings – My Device. 3. Examine the Battery in Settings. Sounds simple and it is. On my phone, you navigate by clicking Settings, then More and then Battery. 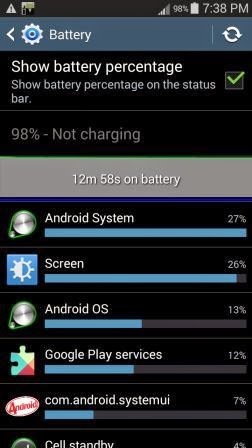 This will tell what is using your battery and you can take steps to shut down those apps that you don’t need. 4. Examine recent apps and close down the ones not being used. Identify running apps can be tricky to find at first. Hold the home button for a couple of seconds, then when your recent apps appear, click the icon on the lower left that looks like a pie chart. Note: if you prefer you can simply swipe the app from your recent app list. 5. Turn off wifi – This was not one of my early strategies and one I did not embrace until my near dead cell phone incident. I was initially resistant as I thought “what’s the big deal?” – I want my wifi and it costs nothing for wifi so why not leave it on. In hindsight, I think this was one of my big issues. Sure the wifi wasn’t a big deal while in my home and hooked to my recognized home network. But once you hit the road, I believe having the wifi on might significantly contribute to a drain on the battery. Specifically I suspect that when the device has wifi on, the phone will continually be checking (scanning) for a recognized wifi network to operate on. Wifi can quickly be turned off and on by swiping downward from the top of the device and clicking the wifi toggle. 6. Turn off data – This was one of my earliest strategies (and obviously didn’t work by itself as noted by my nearly dead phone), but this strategy will take some load off the device by potential apps seeking to refresh. I’d also add to consider disabling automatic updates and set the setting for Background data restricted. You can disable automatic updates in the Google Play store. The setting for restricting background data is sort of buried. On my device you go to Settings, then Data Usage, and then click the button to the left of the home button to bring up the menu and click the checkbox to restrict the data. 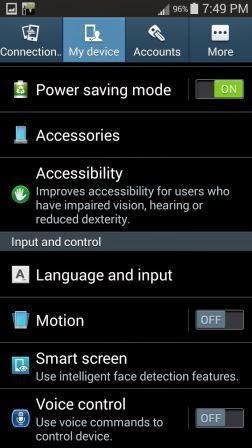 Tip: There are apps to help with this setting. I have downloaded and am using Power Toggles and have placed a very convenient data toggle in my notification area which is also easily accessed by swiping downward from the top of the device. 7. Clean up your screens. 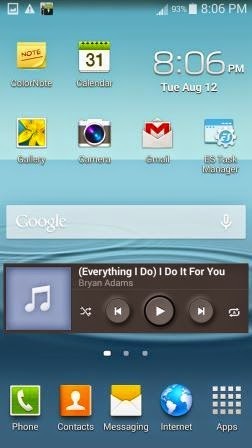 Many folks are nervous about customizing their screens – do it! Your choices may not only improve your battery conservation, but will also make your phone more useful to the stuff that you use most. Some of the default widgets may consume battery resources which may not be worthwhile to you on a cost benefit basis. For example, the initial setup of my device had a nice large widget on the home screen that showed the time and weather…sounds nice. However, it takes energy for the weather data to refresh and this widget while flashy looking hogged nearly half of my home screen. I’d much rather use that space to place shortcuts to my frequently used apps…and I can look out the window to find out about the weather. 8. Find a good app to help you. I use and recommend ES Task Manager which helps me look at settings and control my device in a different view. Yes, many of the features can be found somewhere in the current Android operating system, but sometimes a different perspective helps you to see choices quicker and more efficiently than working through your Android settings. 9. Consider turning off Location Services. I have not yet done this, but some have remarked that this is a drain on the battery. My reluctance to do this is that using the GPS and map is one of the more likely services that I would use while on the road. For example I was using Google maps from my phone just last week and I noticed that the positioning worked even without accessing data. I don’t understand this either, but I witnessed the dot (me) moving along with my position on the map and it was very helpful in guiding me to my destination. Regardless, if you want to maximize your standby time on your phone, this can easily be turned on and off by swiping downward on your phone.